New Zealand's kilometer long natural Nikau Cave. No photos allowed; this one was pilfered from the Nikau Cave website. besides lots of cows and few sheep. Finding unofficial campsites is one of Wayne’s many talents. Confident in his ability, our plans for where to stop for the night between New Zealand’s biggest city, Auckland and the arty surf town of Raglan were loose. Besides, in a pinch we knew our options ranged from a smattering of more official campsites or more expensive but long promised clean-white-sheets motel. We were well prepared; our previously peppy wagon was loaded to the point of somewhat reluctantly climbing hills. Food, camping gear, and attire for anything from a day at the beach to several days tramping or camping in cold mountainous country. Three years in primarily tropical weather increased my cold-weather wimp factor immeasurably. Wayne took in hopes of finding an informal (free) campsite. 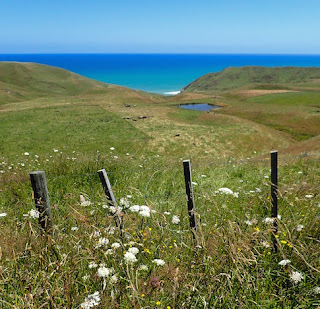 Leaving New Zealand’s main highway 1, we meandered back highway 22, which traverses a chunk North Island, South bound. We stretched our legs at a black sand surf beach, Port Waikato. 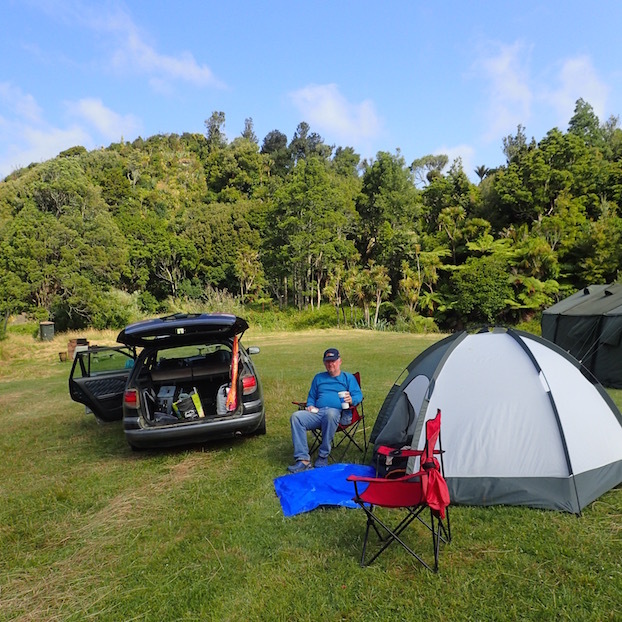 On the way back to the highway, we perused the Kiwi Campground in town. Flat lawn, fences and an uncoordinated collection of uninteresting outbuildings, it piqued our desire for alternative options. 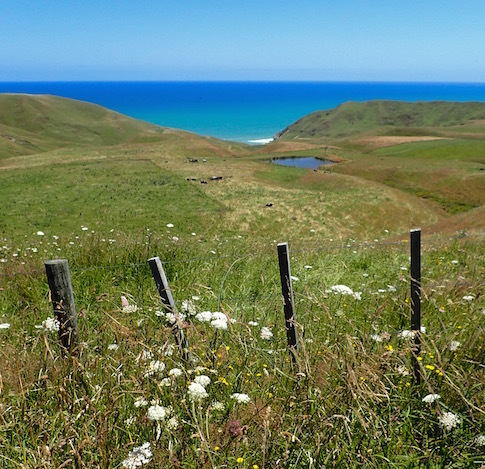 We wandered the Waikato Scenic Sand Dunes (photos in an upcoming post) then re-entered New Zealand’s vast stretches of privately-owned pastureland, rolling hills, still vibrantly green from this year’s prodigious summer rain. It’s no coincidence the strength of New Zealand’s dollar in part rises and falls with the worldwide price of milk. Making hay bales created the Nikau Cave campsite. As we approached Nikau Cave, Wayne tried out a random side road or two in the hopes of finding an informal campsite for later. Like the song, “The bear went over the mountain to see what he could see…. He saw another mountain…. He saw another mountain…” mile after mile – or here – kilometer after kilometer revealed yet more barbed wire fences corralling in livestock. 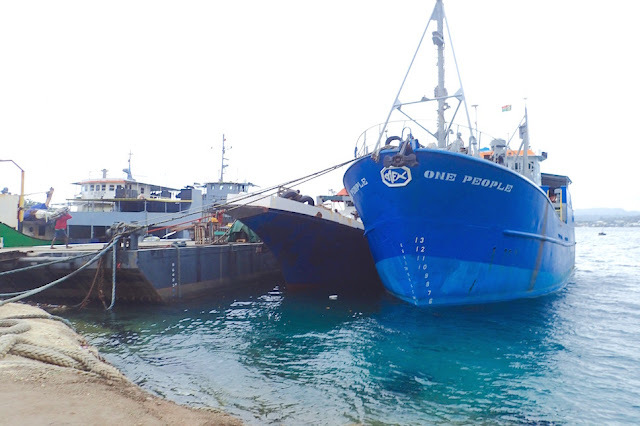 Even if we wanted to ask an owner if we could camp on their land, how would we access them across a sea of barbed, likely electrified wire and closed gates? Back onto 22, we resumed heading to Nikau Cave, Vancouverite Vickie Kessala’s favorite guided glow worm cave (click here to find out what a glow worm is) in New Zealand. We felt welcomed at the rambling café. Wayne enjoyed a delicious chilled plum cider while I toured the cave. A kilometer long, the $40 NZ cave tour* which primarily trails through a shallow stream, takes a while. Left deliberately natural, with few man-made accommodations for touring, completing it required much stooping, twisting and turning and even a stretch of slithering over the cave’s creek bed. The glow worms are cave-dwelling larvae, clustered relatively close together. Their sticky web-like strings trail to capture insects (often including glow worms who mature into flying, egg-laying creatures) for food. Inside a darkened cave, glow worms emulate a starry night. *Nikau is one of the less expensive New Zealand guided cave tours -- or so they claim. Since heard likely Nikau's on par with the more popular Waitomo Caves, though Waitomo's a different kind of experience -- via boat. Ohhh .Ahhh. We borrowed a Nikau Cave queen-sized mattress. Rejoining Wayne, I asked Grace, who guided our cave tour, about camping at Nikau. Grace pointed me to Anne, the property owner. Our timing was serendipitous. They’d recently created “Tent City” for a 30th birthday party celebration and were happy to let us stay there for free. “Do you have your own tent and mattresses or our want to use ours? Anne asked. Ours, we let her know. “There’s also an enclosed shed if you want,” she offered. Anne directed us to Tent City where several tents large enough to stand on nestled in a flat, grassy freshly mown hay field. There was also a BBQ pit, benches, veggie garden, sink with running water, outhouse and burbling stream. We had this lovely oasis all to ourselves. 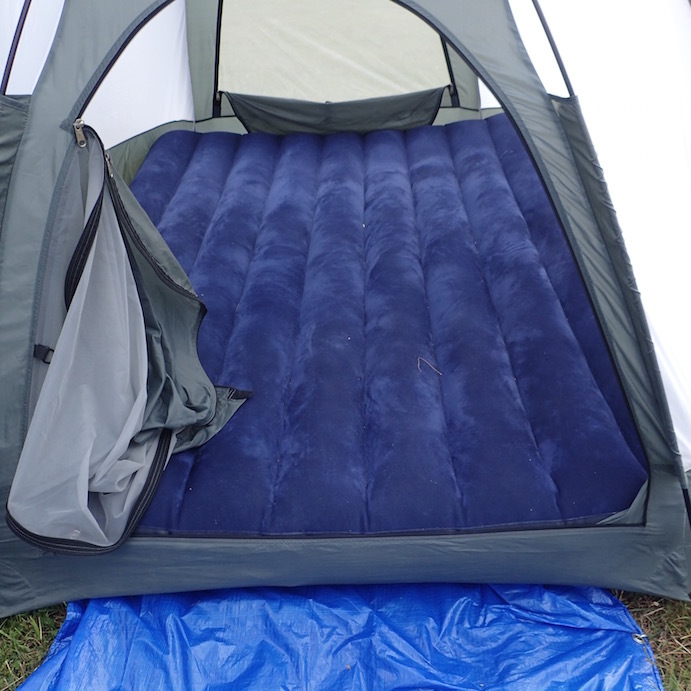 We stuck with our tent, but did avail ourselves to use one of the pre-inflated thick, queen mattress left inside the tents. Wayne at "our" free Nikau Cave campsite. We had it to ourselves. We enjoyed a nice meal, a good rest and even hot coffee and a hot water sponge bath from our new camp stove. 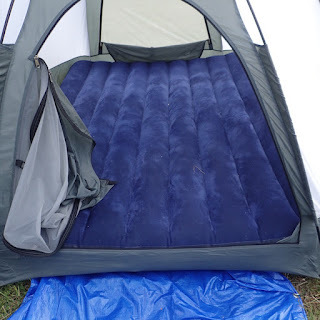 We could even sit up in bed without thumping our head on anything hard. 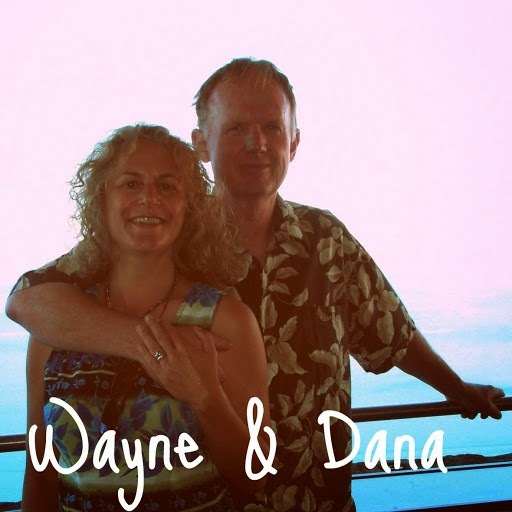 Wayne couldn’t believe our luck at finding such a sweet spot. I had faith. The next morn we happily stopped back at the café to thank Ann for her generosity, letting her know what a treat it was for us. We also appreciated Ann letting us know the Waingaro Hot Springs, which we’d planned on stopping at and was written up in our guide book, was no longer a going concern. Saved us some time and petrol. 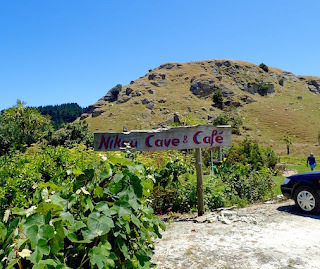 If you’re traveling New Zealand and exploring its smaller highways, treat yourself to a respite at Nikau Cave and café, and cider. The other food looked yummy too! And enjoy the cave tour, but be sure to bring a change of clothes for afterward. We're currently road-tripping in New Zealand until February 8, 2016. We're in Wellington now heading to New Zealand's South Island in two days. 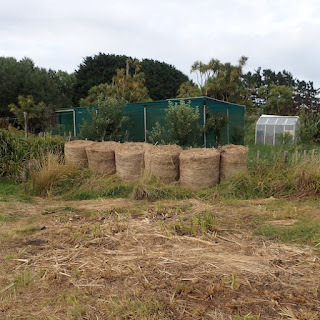 This post is about our travel in the area between Auckland and Raglan. Meanwhile our boat is in Whangarei's Town Basin Marina (S35.43.474 E174.19.599), soon to move to Riverside for haul out.